234 pages | 62 B/W Illus. 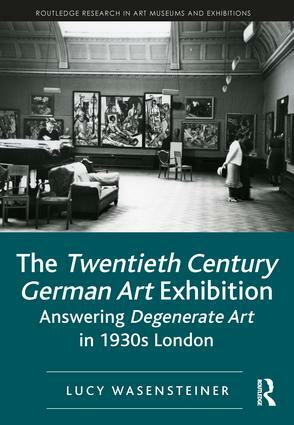 This book represents the first study dedicated to Twentieth Century German Art, the 1938 London exhibition that was the largest international response to the cultural policies of National Socialist Germany and the infamous Munich exhibition Degenerate Art. Provenance research into the catalogued exhibits has enabled a full reconstruction of the show for the first time: its contents and form, its contributors and their motivations, and its impact both in Britain and internationally. Presenting the research via six case-study exhibits, the book sheds new light on the exhibition and reveals it as one of the largest émigré projects of the period, which drew contributions from scores of German émigré collectors, dealers, art critics, and from the ‘degenerate’ artists themselves. The book explores the show’s potency as an anti-Nazi statement, which prompted a direct reaction from Hitler himself. Lucy Wasensteiner is Lecturer in Art History at the University of Bonn, and Associate Lecturer at the Courtauld Institute of Art in London. Routledge Research in Art Museums and Exhibitions is a new series focusing on museums, collecting, and exhibitions from an art historical perspective. Proposals for monographs and edited collections on this topic are welcomed.